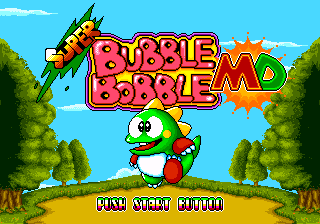 Super Bubble Bobble MD is an unlicensed Sega Mega Drive game most likely developed by Gamtec. As the name suggests, it is an unlicensed attempt at mimicking the formula of Taito Bubble Bobble. The game allows the user to play as Bub and Cororon, as well as anime characters Crayon Shin-chan and Doraemon.